Santos Beach Flat no.26 - Mossel Bay Accommodation. 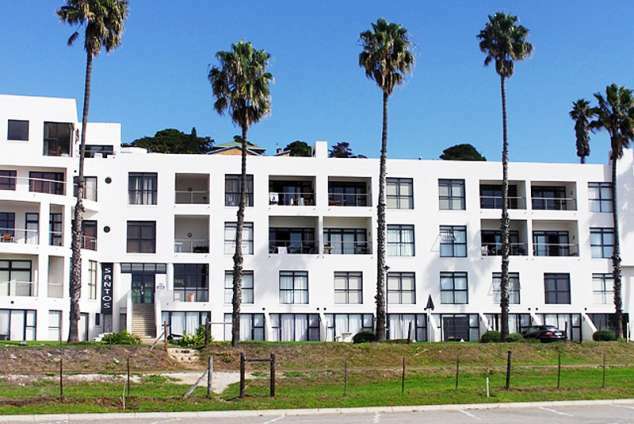 Santos Beach Flat is situated right in front of the famous Santos Beach, in the coastal town of Mossel Bay. Activities right on your doorstep includes swimming, fishing, snorkelling, whale and dolphin watching. The apartment is fully equipped and consists of 2 bedrooms. One double room with breathtaking view over Santos Beach, harbour, town and Outeniqua Mountains. One bedroom with two single beds. One bathroom. Open plan kitchen/living area. Television with selected DSTV channels. Private balcony with a Weber for those who enjoy their barbeque. Enjoy spectacular views from the kitchen/living area and balcony. Kitchen equipped with stove, microwave, dishwasher, fridge/freezer and utilities. Sleeps 4. Linen and towels are provided. Do bring own beach towels. A cleaning service is available at your request. While walking on the beach, you can visit restaurants, museums and the Yacht Club. The Santos Beach Flat is only 5 minutes drive from the Mossel Bay Golf Club. 24 hour security at the Santos Flats. Mossel Bay, gateway to the scenic Garden Route, offers Seal Island Trip, sunset cruises, breathtaking nature trail, wildlife sanctuary, game viewing,4x4 and quad bike trails, surfing and many more. Shark Cage Diving and Bungi Jumping for the more adventurous. A number of highly rated golf courses are in close proximity. Within 20 minutes drive from George Airport and an hour's drive from scenic towns such as Plettenberg Bay. 40661 page views since 26 May, 2009. Last updated on 11 Apr, 2019.